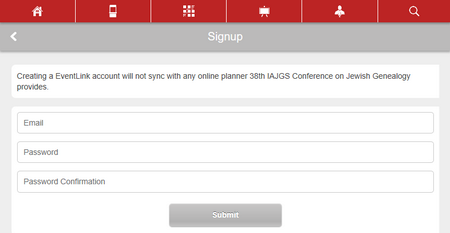 This page provides some instructions and hints for using the Conference App. Quick Link to Web Version: Click here. For smartphones and tablets, the app can be downloaded from the Google Play Store, the Apple Store, or Amazon (not sure how that works). In all cases, search for “IAJGS”. 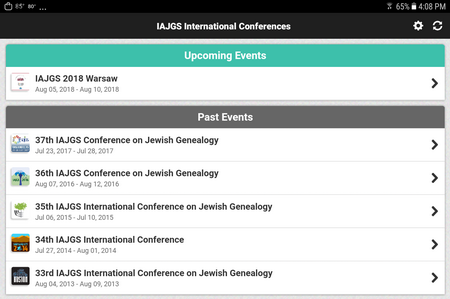 Install the app in the usual way; when asked, select the 2018 conference. If you do not already have an account, you create one as follows. Go to the URL above. You will see a screen like this. Click on one of the icons, such as “My Schedule”. If you are not logged into an existing account, you will see a screen like the following. (If you have an account already but are not logged in, you can log in from this page using your email address and password.) 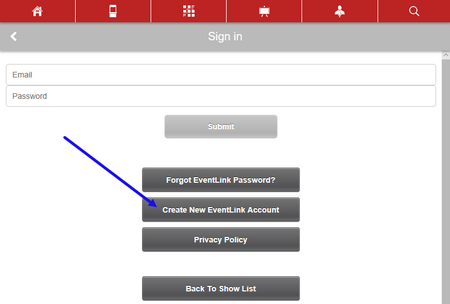 To create a new account, click on the “Create New EventLink Account” button. You will now get the screen for creating a new account. Fill in your email address, and enter the password you want to use in the two indicated places. Then click the “Submit” button. The message in the box at the top simply means that you cannot sync to another account from the browser-based account. However you can sync to the browser-based account from a smartphone or tablet, as described in the next section. If you already have the app installed from a previous year’s conference, you need only add the data for the 2018 conference. When I opened the app on my tablet for the first time since last year, I saw the following screen. The next step is to tap on the bar for the new conference under “Upcomng Events”. Now you will see a screen asking for permission to download the data for this year’s conference. Tap on the “Download” button. The data will now begin to download. It may take a little while, but there is a progress bar to let you know that it is working. 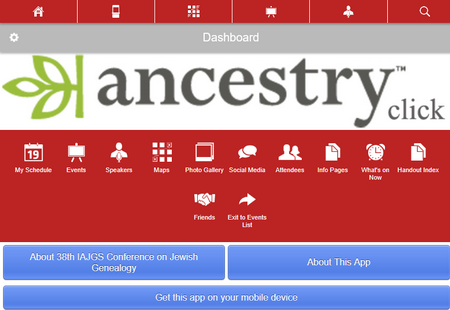 Once the download has finished, you'll see the home screen for the 2018 conference. 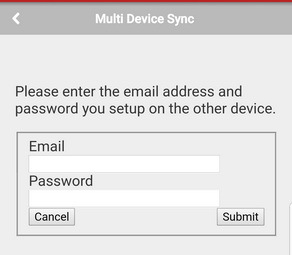 If you install the app on multiple devices and/or set up an account in the Web version, you can configure them to share data. Here we show how to do that starting at the home screen on an Android phone. Tap on the gear icon just to the right of “Dashboard” at the top-right. 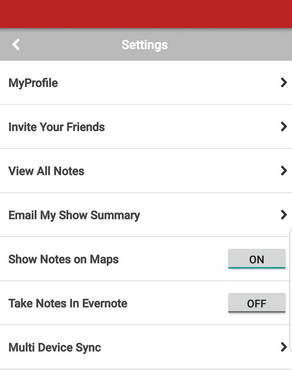 You will now be on the settings page, the top of whose screen is shown here. 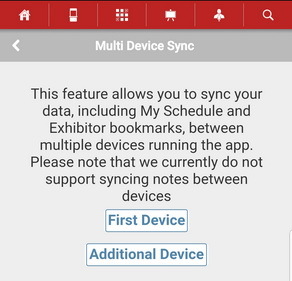 Now tap on “Multi Device Sync” (last item in image below). You will see the following screen. Tap on “Additional Device” to connect another device. 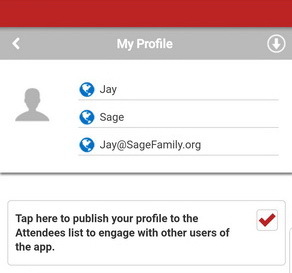 The most frequent question has been about getting oneself to appear in the list of attendees on the app. This is part of the profile setup. You will now be on the settings page, the top of whose screen is shown here. Now tap on “MyProfile”. The top of the profile setup screen is shown below. Fill in your first name, last name, and email address. (You can also fill in any additional information in the area below what is shown here.) 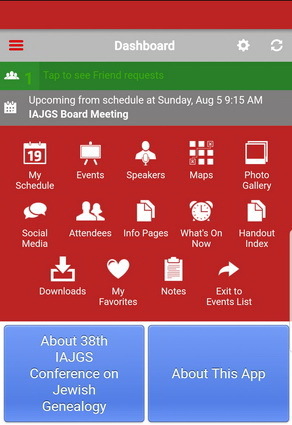 If you want to appear in the attendee listing, be sure to tap in the check box area at the bottom-right in this screen shot so that a red check mark appears. NOTE: Changes made in the app on a phone do not take effect until you do a data update. To make sure that you have the latest data, tap on the refresh icon just to the right of the gear icon at the top-right. You might want to do this each time you open the app after a length of time. This problem can be solved by linking (syncing) the multiple accounts. 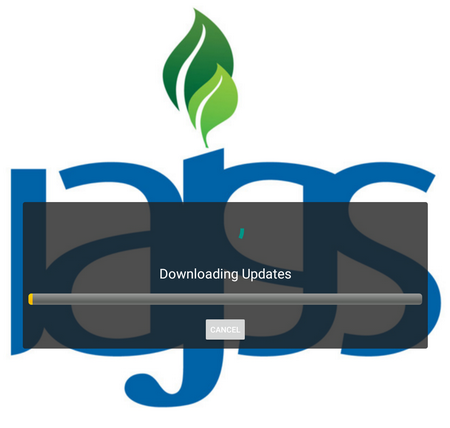 The procedure is described above in the Syncing Multiple Installations section.